EasyRotator - Free jQuery Rotator / Slider Builder. More content, Less space. By automating common development tasks, our products and extensions boost productivity and let you focus on the big picture. Instead of slaving over code, you'll be able to put your energy into what you do best - being creative and making great user experiences. What sets us apart? Customer dedication. If you need help after purchasing, we offer support that's knowledgeable, responsive and, best of all, complimentary. If you're ever dissatisfied in any way, we offer a 30-day money-back guarantee on all purchases. 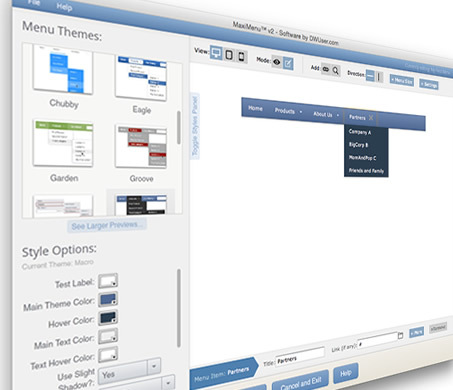 The MaxiMenu v2 Extension for Dreamweaver allows you to create powerful responsive html5/css3 menus, directly in Dreamweaver CS3, CS4, CS5, CS6 or CC. The customization potential is incredible. Begin with one of the 18+ beautiful starter themes, then customize without limit. There's so much more. The sky's the limit. EasyMapBuilder is a Dreamweaver extension and Standalone app that makes it drop-dead easy to add customized Google Maps to your website. No coding knowledge needed at all. Try the live demo now to see how easy it is! Everything is customizable, and there are even 50+ themes to style your map! Maps are responsive-ready. Do you know when your site's content changes or pages go down? 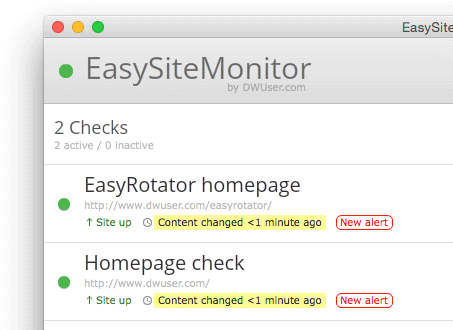 EasySiteMonitor keeps track of it all, sending you alerts whenever anything happens. Get some peace of mind before trouble strikes.